Age As on 31-12-2019, Relaxation as per Govt Rules. Passed Intermediate/12th/HSC Exam with Biology/ Mathematics/ Agriculture Subject with minimum 50% marks(5% Relaxation for SC/ST Candidates) from any Recognized Board and Domicile of MP State. 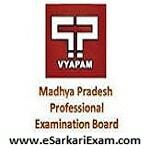 Eligible Candidates can Submit MP DAHET 2019 Online Application at the Official Website of MPPEB Vyapam Latest by 30th March 2019. Open DAHET Online Form Link.